That is exactly what recently happened to a group of rather surprised people out for their morning walks. So was their find the greatest archeological discovery in a millennia? Did they stumble upon proof that dragons once roamed the earth? Um, not so much. But they did stumble into a rather cool viral marketing campaign from blinkbox. 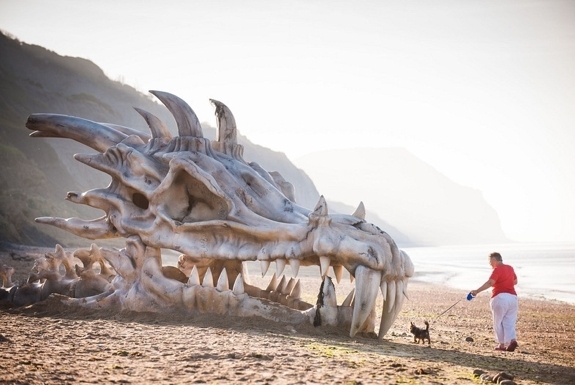 The fake dragon skull was planted there to celebrate the England-based online streaming video service winning the rights to make season 3 of the Game of Thrones available to its viewers a full three months before anyone else. (Even Amazon Prime currently has only seasons 1 and 2 of the hit TV show). The stunt was inspired by a scene from the show in which Arya Stark (played by Maisie Williams) is stunned to find a almost identical-looking dragon skull in the dungeons of King’s Landing. The similarly stun the unsuspecting folks walking along the beach that morning, blinkbox hired a group of artists to craft an enormous, replica dragon skull out of styrofoam. The end result was nearly as large of one of London’s famed double-decker buses: 40 feet (12 meters) long, 8 feet wide and 9 feet tall. Check out the making-of video, below. No word on how long the skull will remain where it is. 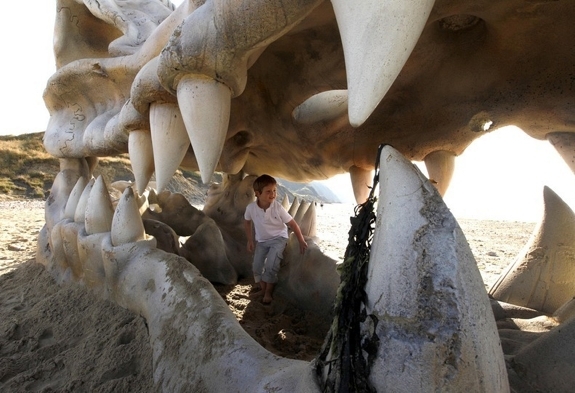 To hunt for it yourself, head to Charmouth Beach in Dorset. Or check out our travel blog’s other cool England travel ideas.